Automatically Log Off Inactive Windows 7 Users after a specified period of time; learn two different methods to automatically log off an inactive user on Windows 7. In my house we have a media server/Minecraft machine that my son uses. It runs Plex, our shared iTunes library, etc. In addition to that it’s the main machine my kid uses to surf the net or, more importantly to him lately, to pay Minecraft. He’s with me 50% of the time so there’s no reason that the other 50% of the time, if he’s not using it, that his user should remain logged into the machine. If you have a similar scenario, or any other reason you’d want to automatically log off an inactive Windows account here’s how. I had to poke around for a while to figure out how to make Windows automatically log off a user; it seems like it’s harder than it should be and I don’t know why something like this isn’t built right into the OS. In order to set up your machine to automatically log off an inactive user you’ll need to have admin rights to the machine, download a toolkit from Microsoft, and make some registry settings. If you’re not comfortable with any of that you might want to skip to the section at the bottom for a 3rd party utility to handle this for you. Don’t worry though, it’s not terribly difficult if you know some Windows basics and follow the steps. Remember, you’ll need to be logged on as administrator or with an account with administrator privileges in order to configure Windows to automatically log off a user after a specified time period. We’ll be making registry changes in these steps so make a backup first. If you’re not comfortable with this (you can potentially f’up your Windows installation) skip to the next section. For more information about how to back up and restore the registry, check out How to back up and restore the registry on the Microsoft Knowledge Base. Download and install the Windows 2003 Resource Kit from Microsoft. It contains WINEXIT screensaver that allows use to make a user automatically log off. The Windows 2003 Resource Kit can be downloaded here. Fire up the registry editor via the Start Menu or by hitting the orb and typing regedit in the input box and hitting Enter. When the machine reboots log in as the user you want to be able to make automatically log off after a specified period of time and set their Windows Screensaver to Logoff Screen Saver, set the wait time, and click settings to adjust any settings you want to modify. For instance, I told it to force application termination and modified the Logoff Message. That’s it! Your machine will now automatically log off an inactive user via the Logoff Screen Saver. If this all seems to complicated Grimadmin.com has you covered. 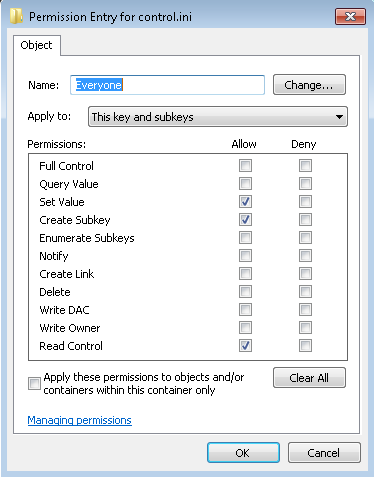 I haven’t personally tested this but Grimadmin.com has what looks to be a super simple way of accomplishing all of this without touching the registry (I didn’t find this until after I had done the steps above). 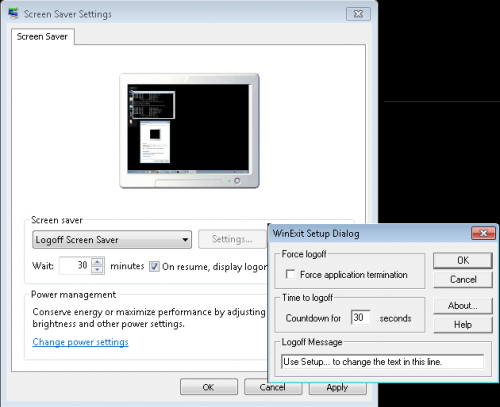 Screensaver Operations allows you to perform configurable actions after a computer has been left idle for a specified amount of time. It’s a free and highly customizable application that works with 32bit and 64bit Windows flavors of Windows Vista and Windows 7. Hit up Grimadmin to download Screensaver Operations for Windows. I’m interested in applying winexit.scr or a 3rd party app in a lab environment of approx 30 VMware-hosted Windows systems (XP, Win7, Win8) that are all accessed via remote desktop. Stale sessions are an ongoing problem due to techs disconnecting vs. logging out. 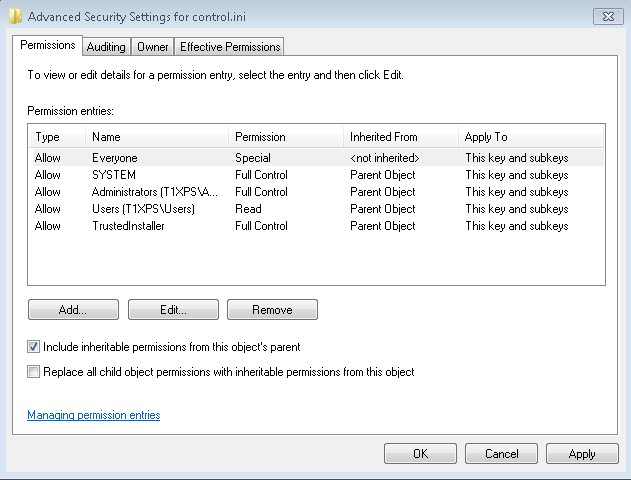 All accounts that access the VMs have admin rights so they can add/remove apps for testing. I therefore didn’t implement the registry steps described above and elsewhere, thinking they are specifically intended to make winexit.scr work for non-admin users. The key problem I’ve encountered is that winexit.scr doesn’t work via RDP session since screen saver function is disabled in remote desktop mode. Is there any workaround or alternative app you know of that will auto-logoff stale RDP sessions? Or should I have implemented the reg tweaks? I did find the app ActiveExit, but am not eager to shell out what they’re asking $$$-wise. I’m also not a full domain admin, so I don’t have the ability to manage this need via group policy.